All are welcome to join the Liz Claiborne Center for Humanism in Medicine for a very special book event! 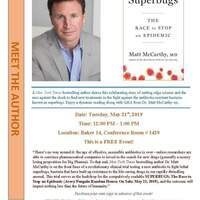 Dr. Matt McCarthy, Assistant Professor of Medicine at Weill Cornell and Staff Physician at NewYork-Presbyterian Hospital, will be giving a dynamic reading of his new novel, Superbugs: The Race to Stop an Epidemic. Following the reading, attendees will have the opportunity to participate in a Q&A with our author. Due to limited seating, please be sure to RSVP by Friday, May 10th to: Jal9088@med.cornell.edu. We look forward to seeing you on Tuesday, May 21st! SUPERBUGS - A New York Times bestselling author shares this exhilarating story of cutting-edge science and the race against the clock to find new treatments in the fight against the antibiotic-resistant bacteria known as superbugs. Liz Claiborne for Humanism in Medicine is an initiative of the WCM Division of Geriatrics and Palliative Medicine.